Adding the right menu mix of healthy choices can boost your business. We can help. We're seeing healthy choices move from a dusty corner of the menu to a vibrant part of the menu mix. Canadians look to restaurants to give them healthy options loaded with positives—tell them what they gain rather than what they lose. So, 'low sodium' morphs into 'citrus-infused,' for instance. But who is really looking for healthier menu options? offered on menus today. That spells opportunity. with a range of healthier dishes on your menu. Clearly, low sodium and low fat options should hold more weight when developing healthier choices for your foodservice menu. Although your guests may ask for these options, they won't sacrifice flavour. Not surprisingly, 95% of Canadians say the taste of food is the most important component when dining out.1 Use descriptive menu cues to illustrate the deliciousness of your healthful dishes. 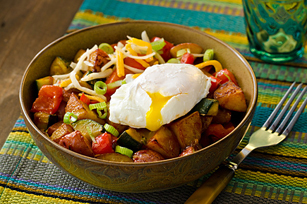 Red potatoes sautéed with fresh zucchini and red pepper tossed in a sweet-smoky barbecue sauce. Crowned with a poached egg, Cheddar-Jack and fresh scallions. 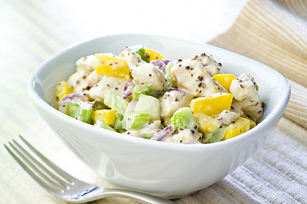 Creamy Dijon-spiked chicken salad with crisp celery, fresh red pepper and red onion. Fresh baby arugula, kale, Belgian endive, red bell peppers and yellow squash are tossed in a sweet and tangy balsamic vinaigrette, sprinkled with toasted walnuts. 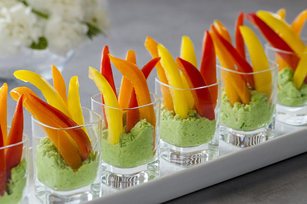 Dip red, yellow and orange bell peppers in a Sriracha-laced creamy edamame dip. 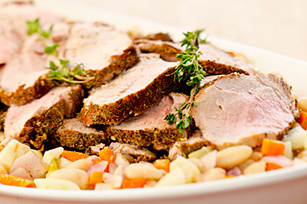 Cinnamon & thyme infused roasted pork tenderloin served over a white bean ragoût with fennel, carrot and red onion. Rely on alternative, creative ways to boost flavour while staying in the realm of a better-for-you choice. 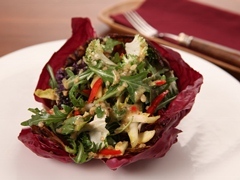 Marinate proteins or vegetables in Kraft Calorie-Wise Zesty Italian Salad Dressing. To help reduce fat, use a vegetable purée instead of a roux as thickener. 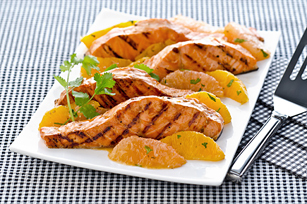 To help reduce sodium, replace salt with a squeeze of grilled lemon halves on fish or chicken. Although menu labelling is not yet mandatory, two-thirds of Canadians like the idea, and value nutritional information as important.1 The data points to another business opportunity: 52% say they would be more likely to choose a restaurant with detailed nutritional information.1 But only one in five can recall seeing this type of information on restaurant menus.1 Set yourself apart from the competition by running nutritional information on your healthy menu options. Kraft can help—all of our Healthy Living recipes provide full nutritionals. Rely on spices from the global pantry to dial up flavour. They offer intensely flavored alternatives to fat-enriched sauces and garnishes. menus. Apart from a better-for-you message, grains also help characterize global profiles.